In fact, the mother-and-daughter team that owns and runs Michael's Consignment recounts a common occurrence from years past when a customer would recognize a friend or neighbor coming into the shop. 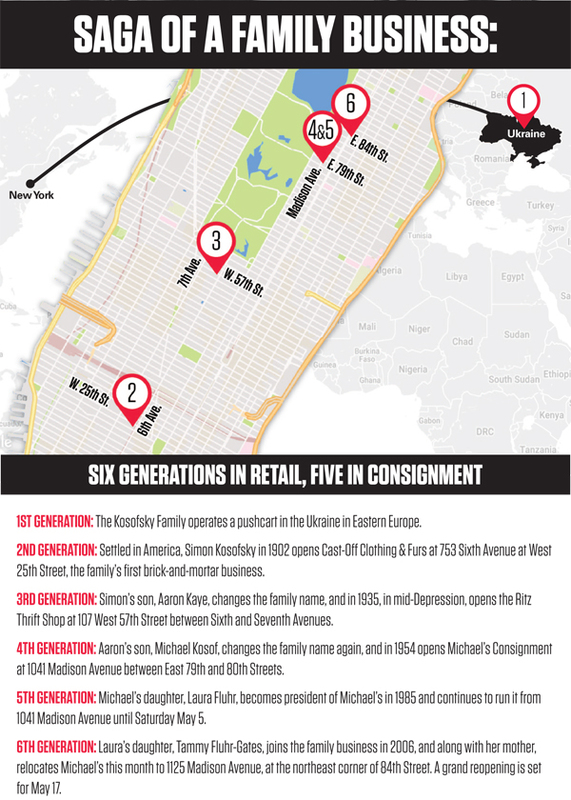 Founded in 1954 by the late Michael Kosof — the father of Laura and grandfather of Tammy — Michael's was one of the first consignment shops in America, and also one of the priciest, and for 64 years, it maintained a discrete second-floor entrance at 1041 Madison Avenue just north of 79th Street. Society eventually caught up. Recycling came into vogue. Sustainability became a buzzword. Retailers who placed environmental watchfulness at the core of their companies, consciously or not, thrived. And lo and behold, it turns out that's exactly what Michael's and two of the family's predecessor businesses had been doing for the past 116 years — recycling clothing in the secondary marketplace. It's a tradition that dates back to at least 1902, when Tammy's great-great-grandfather, Simon Kosofsky, established Cast Off Clothing & Furs at 753 Sixth Avenue in Chelsea. Then, Michael Kosof, who changed the family name yet again, brought sustainability to the Silk Stocking District when he ventured to Madison Avenue two decades later. Which takes us up to that second shop entrance. In September 2017, Naftali Group, a midtown-based developer, closed on the $21 million purchase of 1041 Madison, a five-story, mixed-use building, as part of an assemblage of four adjoining buildings, between 1039 and 1045 Madison, it has been piecing together for an unspecified residential project. Naftali's real estate play means that Michael's had to find a new home. It also created uncertainty over the future of Gentile's Fine Foods, another multi-generational mom-and-pop, which is housed on the first floor of 1041 Madison and first set up shop on the East Side in 1927. At the same time, at least two other upscale retailers are also expected to be impacted: Davide Cenci, the Italian menswear brand, located at 1043 Madison, and Eileen Fisher, the women's clothier, at 1039 Madison. Michael's was the first of the affected enterprises to make its move, and while the reinvention of the block was the catalyst, the owners say it led them to reconfigure their business in a fashion they had long contemplated. “For many years, I thought about a ground-floor entrance,” Laura said. But as she got older, it became less urgent. Then one day, out of the blue, the forced relocation presented an opportunity, she added. Agrees Tammy, “The truth of the matter is that it pushed us to do something we've wanted to do for quite a while.” Remaining in one place since 1954, enjoying a great run and commercial success, “You get comfortable,” she said. Now, the two women were ready to walk down those second-floor stairs for the last time. The formula would remain the same — the buyer gets a luxury product in mint condition for less than retail price, the seller monetizes an item she no longer wants, the merchant makes the match, reaping a percentage of the sale — but all parties would now enter the new place of business at street level. So Laura and Tammy found a new home and inked a deal fairly quickly. Saturday May 5 was the last day at the old location, and on Sunday May 6, they completed the move, four blocks to the north, to a wide-open, sun-lit 1,200-square-foot shop at 1125 Madison Avenue at 84th Street. It's not a discrete hideaway. It wasn't meant to be. It has two corner windows that give it an inviting aspect, and it's just south of the city's original Le Pain Quotidien at 1131 Madison Avenue. A soft opening is planned for this week with a grand reopening slated for May 17. Indeed, the most expensive item now on sale in the shop — a mini-Hermes Birkin bag, black with gold hardware — will set you back $15,000. The store record? Another Hermes Birkin, pink with ostrich leather and silver hardware, which went for $18,000. Still, not all of Michael's items will break the bank: The average sticker price is $300, and the least expensive item on the sales floor is a $15 bracelet from Alex & Ani.